Although stasbot couldn't make the actual event, I used my own log to give to stasbot. Unfortunately, stasbot is yet to review it and decide upon some stats. After that's dealt with, nfield or I should have it posted here. Participation wasn't awesome, but it was decent nonetheless. A few Jeopardy casuals were missing unfortunately, and the scores were a bit low. On the plus side, ChanServ beat some people with a new personal best of 1200. [19:07:04] * @tiger10x RBY 200 * This is Lt. Surge's highest level Pokemon. [19:07:13] <+Sneaky_Sneasel> What is 28? [19:14:51] * @tiger10x GSC 800 * The Day-Care can be found on this route. [20:02:20] * @tiger10x Daily Double Dex * "It has a very fine fur. Take care not to make it angry, or it may inflate steadily and hit with a Body Slam." But he got it wrong. RBY 200 * This is Lt. Surge's highest level Pokemon. RBY 400 * There are this many different types of PokeBalls. RBY 600 * This Item ended being replaced by the Exp. Share in later generations. RBY 800 * "Use Control Pad To Surf Rad!" RBY 1000 * This stone-evolved Pokemon can be found wild in Cerulean Cave. GSC 200 * TM27 contains this move. 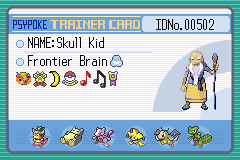 GSC 400 * Headbutt's TM can first be obtained here. GSC 600 * This is the range of possible DV numbers. What is from 0 to 15? GSC 800 * The Day-Care can be found on this route. 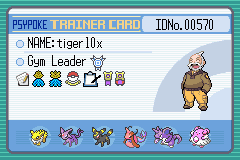 GSC 1000 * Falkner is the Gym Leader of this city. RSE 200 * This PokeBall can be obtained through winning contests. What is the Luxury Ball? RSE 400 * This many Shoal Salts and Shoal Shells are needed to get a Shell Bell. RSE 600 * The Item "Letter" must be delivered to this person. RSE 800 * The Pretty Petal Flower Shop can be found on this route. RSE 1000 * The Pokemon Fan Club resides in this city. Daily Double FRLG * Seel is exclusive to this version. FRLG 400 * After the Elite Four is upgraded, your rival's highest level Pokemon is this level. FRLG 600 * This Item can be found by using the Itemfinder where Mr. Fuji was stood in the Pokemon Tower. What is the Soothe Bell? FRLG 800 * Pokemon Mansion has this many floors. FRLG 1000 * This is the person that gives you the Rainbow Ticket. DP 200 * This is the name of the location on top of Mt. Coronet where you can catch Dialga or Palkia. What is the Spear Pillar? DP 400 * This Item is needed to evolve Happiny into Chansey. What is an Oval Stone? DP 600 * This is the island where Darkrai appears. DP 800 * Double-Edge is this number TM. DP 1000 * These two old Bug moves switched from physical to special. What are Signal Beam and Silver Wind? Misc 200 * A Super Potion heals this much HP. Misc 400 * In a recent CoroCoro issue, a sequel to this Pokemon game was announced. Misc 600 * This is the first Pokemon that Ash catches in Sinnoh. Misc 800 * January 12 is the birthday of this Pokemon game musician. Daily Triple Misc * This is Knock Off's base power. Dex 400 * Porygon2 evolves by trade while holding this item. What is the Dubious Disc? Daily Double Dex * "It has a very fine fur. Take care not to make it angry, or it may inflate steadily and hit with a Body Slam." Dex 1200 * This Pokemon's Japanese name is Beroberuto. Dex 1600 * This Pokemon is Johto dex number 001. Daily Triple Dex * There are this many Psychic Pokemon that cannot learn the move Psychic. Tech 400 * These three Pokemon can potentially yield the most experience points. What are Happiny, Chansey and Blissey? Daily Triple Tech * This is Kecleon's highest base stat. Tech 1200 * The Shuca Berry is derived from this. What is a cashew nut? Tech 1600 * This is U-Turn's base power. Tech 2000 * There are this many total ribbons in the Diamond/Pearl game data. Psypoke 400 * This is the word of 2008. Psypoke 800 * This recent addition to Psydex actually requires an updated version of Flash. Psypoke 1200 * 1000 Psybucks were recently offered for these two Pokemon's forum icons. What are Glameow and Purugly? Psypoke 1600 * Before Orre, Fiore, and Beyond had Azelf, it was named "Other Games Discussion" and had this Pokemon as a marker. What is ^_^_^Jolteon^_^_^ or Jolteon^_^_^_^_^? Free 400 * The first person to buzz in receives free points! Free 800 * The second person to buzz in receives free points! Free 1200 * If you don't buzz in, you receive free points! Free 1600 * The tenth person to buzz in receives free points! Free 2000 * The first person to buzz in receives free points! Misc 400 * This is the longest river in the world. Misc 800 * The New England Patriots is the first unbeaten NFL team since the Miami Dolphins of this year. Misc 1200 * This is the capital of Germany. Misc 1600 * Super Smash Bros Brawl is set for release in Japan on this date. Misc 2000 * This person was the original host of Jeopardy!. Final Clue * This person is the only Gym Leader that you mandatorily fight multiple times in the same game. For the first time all year, a Jeopardy will take place! If it wasn't January, that might mean a little more, but it's not exactly as rare as trivias are known to be. This time, stasbot, the chat stat bot of #psypoke will be playing along, too! More specifically, stasbot will be taking some chat stats of #psypokejeopardy during the event to see how it works out. Watch out though or stasbot could beat you. Jeopardy can be viewed as a twist on the occasional trivia. It uses many more scripts than trivia does due to its complex structure, but it is not difficult for participants at all. After you buzz in, you will have eight seconds to answer. In order to answer, you must give the question to the clue (like normal Jeopardy). For example, one clue would be "this Pokemon is the first alphabetically," and its correct question (what you submit) would be "what is Abomasnow?". If you get the question wrong however, you do lose Psybucks (in the game, not the forums). If you need help, simply watch other people play along. Jeopardy also consists of the ability to choose the next question from multiple categories and Psybuck values. This only happens for the person who gets a question correct though. There are two rounds of six categories and five values, which adds up to 60 total questions. Sometimes however, a round will end a little before all of the questions are chosen if it takes too long. Regardless, this has happened very few times. It even consists of its own bonuses. One Daily Double in the first round and two in the second round can (as they suggest) double your Psybucks in the game. Only the chooser will be able to answer the question, and ten seconds are allowed to answer. Daily Triples made a debut last time, and those can really rack up the points. Other special bonuses come and go. Final Jeopardy concludes the event. Here, one usually tough clue will be given. Like Daily Doubles, you can wager as many of your Psybucks as you want. For this question, an amount of twenty or thirty (depending on the type of question) seconds is allowed for you to think over your answer while you imagine the special Jeopardy music. After this, the final scores are tallied, and the winners are announced. 1. No /me. There are actual reasons why this is a rule, so don't do it anyway. 4. Do not use any reference materials (such as the site). 6. You must use your forum name to receive any prizes. Various exceptions are allowed, but ask first. Also, do not change nicks during the event. How much different is this from a normal trivia? The biggest difference is in the questions themselves. It is possible to lose points, and you have to buzz-in before you answer. The question format for answers is slightly different, too. Similarities are basically in the knowledge bit, and it has the same trivia-like "atmosphere" to it. Benefits of Jeopardy comparatively include the amazingly high Psybucks amounts, an ability for everyone to score more easily or get back into contention for the lead, and the addition of small strategies (picking higher questions and the like). See above for all the little details. Because it's something really fun and worthwhile, and because I said so. Yes, although there is a special category for random knowledge. Click the link and find out. No. There are no extra restrictions like this, but in the event that someone goofs off, I can put he/she on "buzzignore." Yes, so you better type it out first and wait for -m to press enter. Even missing a "z" or using colors would cause the script to skip over you. !stop: Stops the countdown when a person is answering a question. !wager (amount): Allows an easier process for wagering in daily doubles, daily triples and final jeopardy. Only the third and fourth commands there will be mandatory. All will be brought up during the event. This would be supposing that you're late and +m is set. This usually means that it is between questions. +m is a special mode to be set on chat channels that mutes people without special privileges (voice or op). These are only given to staff members and people choosing questions. If they are understandable, they will be acceptable. Eight seconds are allowed for one to answer, so this should not come up too much. I'm not 100% if I can make it that night...sometimes I have to work on Saturday nights. I'm going to assume that cheating will be easily spotted, by you guys changing the psydex? What if there are still discrepancies - "Zomg, you got 5 questions in a row right, you cheatz". Could you just say arbitrarily that all are cheaters? I'm not asking to much..
Just find it in your heart.. This message you just read, was not typed by my hands. But my heart. FInaly, a jeporday, (hopefully) I may not miss! Shame we won't have a retard to laugh at like ghett0 or Munchlax911, because they're banned from the forums. Hopefully, I won't buzz in too early. I probably could have gotten a better score. To be honest, it's trivia that gets the cheaters. I've only done about two of those questions total counting each Jeopardy I've done. Getting five questions in a row is not uncommon, and it wouldn't raise serious suspicion of a cheater. All you have to do is say buzz first and you have your shot. What lets you know that someone could be cheating is if they don't answer (or buzz) for a period of time, and then suddenly come up with the answer. Of course, it could be argued that the person was thinking that whole time. I've suspected many different people of cheating before, and no one can stop that. On the other hand, that doesn't mean that I don't have back up plans specifically for cheaters. I'm not as harsh as other people when it comes to proving the cheater, but at least some people have admitted it when they cheat. Being serious, I've never seen another Pokemon site as well organized as the one we are so fortunate to have. In the case that no one knows the answer right off, I doubt that you could find the answer on some random other site in less than thirty seconds and still even be able to buzz in. Plus, if there are enough wrong answers (four), the question will stop. As for the occasional people that are awful at Jeopardy, it's not something you apply for; it's more of something that you were made for. I can get rid of people that try to get negatives or even make them look worse. Not knowing the answers and completely failing are different things. God dammit, Peanut Lover, is it REALLY that necessary to create drama everywhere you go? Believe it or not, you're NOT part of the staff, so you really DON'T need to worry about cheating/lying/whatever. Christ, please, you're a normal member, and nobody (read: nobody) likes your constant nagging/questioning/etc etc about this and that and things that really have NOTHING to do with you. You're getting as bad as garbanzo, or whatever that colombian ex-user's name was, and you know what happened to him. Wrap-up posted, and stasbot's stats should come in soon. NOOOOOOOOOOOOOOOOOOOOOOOOOOOOOOOOOOOOOOOOOOOOOOOOOOOOOOOO OOOOOOOOOOOOOOOOOOOOOOOOOOOOOO, I MISSES THE JEPORDAY, AGAIN!! !